Discussion in 'Buckeye Basketball' started by brodybuck21, Apr 10, 2018. Chris Holtmann has landed a commitment from Florida State point guard transfer CJ Walker. Walker announced his decision on Twitter. “My family and I have came to a great decision! With that being said I would like to say I have committed to The Ohio State University! The 6-foot-1 Walker will have to sit out the upcoming season. Walker averaged 8.5 points and 2.5 assists for Florida State last season. The Seminoles reach the Elite Eight. His career high is a 24 point game against Rutgers this past season. He made 10 of 11 free throws made that game with 3 assists and a carer-high 4 steals in the Florida State win. As a freshman Walker averaged 4.9 points per game and 1.3 assists. Walker landed the Sixth Man of the Year Award as a member of the Boom Squad (high energy players off the bench) at the 2017 Florida State Basketball Honors Banquet He was also named to the 2017 ACC Academic Honor Roll. Walker is from Indianapolis, Ind., and attended Arsenal Tech. Walker was nominated to play in the McDonald’s All-American game his senior year. The Buckeyes under Holtmann are coming off an outstanding 2017-18 season in which the finished with a 25-9 overall record including 15-3 in the Big Ten. They tied for second in the conference and won their first game in the NCAA tournament. OSU_Buckguy, RB07OSU, MaxBuck and 3 others like this. Welcome to Buckeyes Nation C.J.!!! Welcome to the Buckeye family C.J. 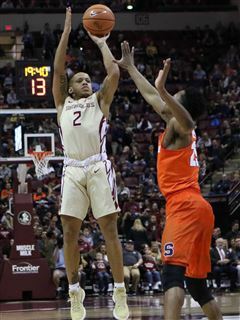 On April 8, Florida State guard C.J. Walker announced he would transfer to Ohio State. That transfer is now official, the school announced Monday afternoon. Walker will have to sit out the 2018-19 season due to NCAA transfer rules, but will be immediately eligible for the 2019-2020 season. Florida State transfer guard CJ Walker will not travel with the team to Spain, OSU coach Chris Holtmann said. Walker, who is not eligible to play this year, will instead head home to Indianapolis to spend time with family. Walker would have been permitted to play in Spain per NCAA rules. Holtmann reiterated that Walker "will be a big part of our team" even though he can't play this year. He was a full participant in Tuesday's practice. OSU_Buckguy, LitlBuck and Thump like this. Forgot about him. When we add him to the incoming class, it looks fantastic. Depth should be off the charts next year. I'll eat my hat if 1-2 guys don't transfer before next season, but even then, yeah, our quality depth should be improved. CJ Walker played two seasons of college basketball at Florida State. But last April, Walker was seeking a different fit and he transferred to Ohio State. Unlike many of the graduate transfers who have immediate eligibility, Walker made the move as a conventional transfer. He had to sit out this 2018-19 season and will be eligible for OSU as a junior in 2019-20 season. Walker enrolled at OSU last summer and has participated in all team activities and practices on campus since then. As a transfer, Walker is not permitted to travel with the team to away games. He also had not been available for interview sessions until this past Friday. Check out some of his comments in the video above. Going back to 2016, the 6-1 Walker was ranked as the nation’s No. 113 prospect and No. 24 point guard according to the 247Sports Composite. The Indianapolis native signed to play for coach Leonard Hamilton at Florida State. He had previously been committed to Purdue and was also a target for current OSU head coach Chris Holtmann during his time at Butler. As a freshman in 2016-17, Walker averaged 12.5 minutes, 4.9 points and 1.3 assists per game for the Seminoles. He moved into the starting lineup as a sophomore in 2017-18. Walker ended up averaging 8.0 points and 2.4 assists per game on 23.2 minutes. He also averaged 1.7 turnovers per contest. He still started all but one game for Florida State, although his minutes diminished as the season wore on. After FSU lost to Michigan in the NCAA Elite Eight, Walker began to look around and ultimately announced his transfer to Ohio State. Speaking on Friday, Walker talked about what this year at Ohio State has taught him. “There have been a lot of ups and downs,” he said. “I played two years at Florida State and then to come in here and not be able to play, there have been a lot of ups and downs. It’s probably been a lot more ups. “Just being around this group and Team 120 has been amazing. I’ve gone through different situations with a different coach and different teammates. It’s gone really well. I’ve just learned basketball from a different perspective on the bench and in practice. Walker was asked how this season could help him prepare for next season. “It’s given me a chance to know myself a lot better and look at my tendencies, what I’m good at, what I’m bad at and what I need to work on,” he said. “I’ve been able to compete in practice every day and not take it for granted. OSU_Buckguy, ShowMeBuck and LitlBuck like this. Also, Ohio State will have the services of transfer CJ Walker. Walker, who transferred in from Florida State, averaged 8.0 points per contest as a sophomore for the Seminoles, and really impressed with his play during practice this year. He and Carton should give the Buckeyes a huge upgrade at the point guard position. MARVYMARV14, OSU_Buckguy and brodybuck21 like this. Should be able to rotate guards like a death machine next year. Can't wait!